This is the second of our free GED 2014 Social Studies practice tests. The GED social studies questions are fairly challenging and you will need to know some basic facts about government, politics, and history. Many of the questions will provide an excerpt from a speech or document, and the answer can often be found within the excerpt. Under the US Constitution, which body has the sole authority to declare war? Only Congress has the authority to declare war, although it is the president who directs the conduct of the war. This is an example of the separation of powers outlined in the US Constitution. Given the above information, which of the following statements is the most logical conclusion? The three highest unemployment rates correspond to the lowest tax revenue figures. Conversely, the three lowest unemployment rates line up with the years where tax revenue was the highest. Which of the following questions about NASA’s budget would be the most difficult to answer? How does NASA spend its money? Does the United States spend too much money on space exploration? How much of an increase did NASA receive over last year’s budget? How much do we spend on astronaut training annually? All of the other answer choices represent questions that can be answered with factual information found in government records. Answer (B), however, represents a question that is seeking an opinion of how the United States allocates its funds. As such, there is no clear-cut, correct answer. What was the primary goal of the Confederacy in fighting the Civil War? The Confederacy (South) never aimed to conquer the Union (North). The southern states were seeking to become an independent country with the ability to retain the laws and institutions they had come to rely upon (like slavery and the plantation economy). What is the most likely reason that the Confederate States of America won several major battles early in the Civil War? The Confederacy had a great supply line to fortify their troops with guns and ammunition. The Confederacy had a much larger army. The Confederacy had superior military generals who outmaneuvered the Union troops. The Confederacy produced more food. Under the leadership of General Robert E. Lee, the Confederacy produced many stunning victories over the Union Army. While the Union Army had most of the military and financial advantages of the war, President Abraham Lincoln could not find a general able to string together a series of wins for the Union. Eventually, General Ulysses S. Grant would command the Union Army to victory. What would be the best title for the chart? 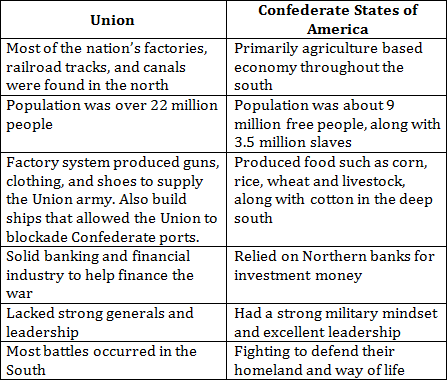 Each column of the chart presents a list of facts relating to the economic and military advantages and disadvantages of the Union and the Confederacy. These facts enable a direct comparison of each region. While each of Florida’s 27 electoral delegates represents almost 480,000 eligible voters, each of the three delegates from Wyoming represents only 135,000 eligible voters. That makes a voter casting a presidential ballot in Wyoming three and a half times more influential than a voter in Florida. This system, along with the winner-take-all practice used to allocate most states’ electoral votes, creates the potential for an absurd outcome. In the unlikely event that all 213 million eligible voters cast ballots, either John McCain or Barack Obama could win enough states to capture the White House with only 47.8 million strategically located votes. The presidency could be won with just 22 percent of the electorate’s support, only 16 percent of the entire population’s. Which of the following statements from the passage is an opinion and not a fact? The use of the word ‘absurd’ is a reflection of the author’s personal feelings about the Electoral College system. The other answer choices are all provable facts that are presented without any attached reference to the author’s judgement. Which of the following statements is a logical inference based upon evidence from the passage? President Wilson does not want the US to retaliate against the Germans. President Wilson believes that the US should retaliate against the Germans regardless of what other countries decide. President Wilson believes fear and anger should stir American support for war against Germany. President Wilson wants to wait and see how other nations respond to the German attacks before declaring war. When Wilson speaks of German "warfare against mankind," it is clear that he wants to retaliate. He also states that "Each nation must decide for itself..." which suggests that the US should not base its decision on that of other countries. Examine the chart and answer the questions that follow. The “right to bear arms” is granted by which amendment of the United States Constitution? According to the chart, which of the following states does not require a mental health background check to purchase a firearm? The second map, titled “Mental health,” shows which states require mental health background checks. California is not shaded, indicating that it does not require background checks.